Our 2018 Strengthening Democracy Awards keynoter weighs in on whether facts are still stubborn things, the future of data- and drone journalism, and why journalism is so important in defending our democracy. 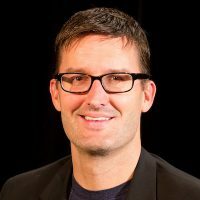 Matthew Waite, Civic Nebraska’s Strengthening Democracy Awards keynote speaker on April 12 (get tickets here), is a professor of practice of journalism at the University of Nebraska. Waite, a native of Blair, Nebraska, is an international expert on drone journalism, having founded the Drone Journalism Lab at Nebraska U. more than five years ago. A former reporter, editor and data journalist, Waite won a Pulitzer Prize in 2009 for his work on PolitiFact, a project operated by the Tampa Bay Times, in which reporters and editors fact-check statements by members of Congress, the White House, lobbyists, and interest groups. During his keynote, Waite will discuss how a strong, independent media protects democracy – and what Nebraskans can do to support it. Civic Nebraska caught up with Waite between his busy schedule of teaching classes, conducting cutting-edge research in the field of journalism, and coaching youth soccer. You won a Pulitzer for developing PolitiFact and ushered in the era of high-profile fact-checking of politicians. That happened at a time when Americans still had some semblance of shared facts when it came to politics. If you were building PolitiFact today, how would you confront the notion of Red Facts and Blue Facts? It’s funny, but back in the early days of PolitiFact, I floated the idea of letting people put a partisan lens over the site. They could click a button, put a particular lens over it, and suddenly their team’s truths would rise and the other teams falsehoods would rise too. We learned right away that the only thing partisans love more than their team being truthful is the other team getting caught in a lie. So the idea was to just give them what they want. I never built it, but back then it felt like a joke – ha ha, we can show people their biases this way. Now I find it sad that we can’t even agree on facts, and my joke is now a business strategy. So what would I do? I’d make something that stripped away the personalities and the parties and the politics and would make it more of a personal empowerment thing: Don’t get fooled. The truth is this isn’t happening. Or this is true, not this. And I wouldn’t say who it was who was telling you the untruth, because people have become so reflexively defensive when their team gets poked. Honestly, what I’m envisioning borrows more from fitness apps than politics or news. It’s no secret that traditional journalism has seen better days — at least from a financial standpoint. In an environment where media outlets feel enormous pressure to maintain healthy profits with fewer resources, how important is it that those outlets maintain a commitment to the common good? Sadly, in many places, it may be the only thing they have left. The Founding Fathers enshrined the importance of a free press in the First Amendment of the Constitution. Audiences understand that good journalism holds the powerful into account. At its best, it acts as a public trust, in the public interest. It’s never been perfect and it never will be. But it’s important. And while I don’t have a lot of market research to back this up, my conversations with people about their local media are about how they support it because they feel they need that public good, that source of information. Local media can’t survive generating the traffic that the big national brands can. That’s not a revenue game they can play. The relationship with the customer is much more personal, and much more real. I would pity the news organization that abandons that public mission. You’re known as a journalism futurist of sorts. What are some of the more exciting things around the corner that you see as opportunities for journalists to maintain a check on power? Any outlets that you think is doing a particularly job of innovating? There’s a bunch, but I’m known for my love of the flying robots, so I’ll start with better environmental reporting via drones. I’m also a proponent of data journalism, and there’s some really interesting advances coming with machine learning and artificial intelligence that are coming to the newsroom soon to help reporters by alerting them to news in streams of data. Newsrooms will have bots that can read through troves of documents or check trends while humans do the messy work of talking to humans. The places you’re seeing interesting things done with data are places like ProPublica, Reveal, the New York Times’ Upshot and Nate Silver’s FiveThirtyEight, but there’s a bunch of more traditional places doing interesting things too. In 2016, the Atlanta Journal-Constitution used machine learning to find doctors accused of sexual misconduct, their actions hidden in more than 100,000 documents. I’m fascinated with the idea of extending the reporter’s reach through assistive technologies. What do you try to instill in your students about their First Amendment responsibilities? That it is a tremendous responsibilty. I talk frequently about the power that journalists have, thanks to the First Amendment, is the power to call attention to a thing. We can, by our choices, decide to put something in front of a large audience. The choice to do that can have positive consequences and it can have negative consequences, and we must be thoughtful. In your opinion, how are Nebraskans in comparison with other states in how they view mainstream media? Are we still generally supportive of media here, or have politics become so nationalized that those same fault lines are starting to show in Nebraska? I think we’re like much of the country right now. We consume the media that favors our team. I think where Nebraska is different is that there are large parts of the state where the information diet is pretty thin. It used to be, you could get the Sunday World Herald from Sterling, Colorado, to the outskirts of Des Moines, and at least once a week you had a perspective bigger than your town but smaller than the country as a whole. No longer. So much of the media diet of western and central Nebraska is a local paper, maybe a weekly, maybe a small daily if close enough to a population center — and whatever is on television. Cable TV news, maybe an AM radio station, which if it has poltical content is almost certainly right-leaning. So to get a range of information, to get diversity of ideas or opinions, they have to seek it out on the internet. Which can be done, don’t get me wrong, but fewer and fewer of us are doing that, choosing to stick with sources that tell us we’re right and they’re wrong. We’re looking forward to having you as our keynote speaker this year. The burning question seems to be: Are you going to bring a drone with you to fly around the hall during the speech? I think I’m contractually obligated at this point, but I’m only going to be talking for about 30 minutes, so I’m going to have to get creative to work it in. To see Waite’s keynote speech, join us April 12 in Lincoln at Strengthening Democracy Awards. Get your tickets here.